If too much time indoors makes you anxious and city walks don’t satisfy your need to escape for a break, consider taking a hike on one of the area’s many trails. Frequently lauded as one of the most ecologically diverse counties in the nation, San Diego is bursting with unique natural areas and paths waiting to be explored. While most county backcountry is dominated by scrubby chaparral landscape, coast, mountain, and desert ecosystems are all found within the county’s border. Hiking options vary from short trails within the city limits to rugged treks in the hills and mountains well beyond, though most require transportation by car (find a cheap one-day rental or zipcar). Balboa Park Trails – This group of trails, measuring 65 miles in total, is the quickest to access from the convention center (approx. 2 miles) and one of the more easygoing spots to hike in terms of terrain. Paved paths lead past museums and manicured gardens in the park’s central areas, but hikers will also find dirt trails through more remote locations. A PDF map of all paths is available, which orients each trail alongside park landmarks. For information on getting to the park, see the final paragraph of the Balboa Park blog post. Torrey Pines State Natural Reserve– The trails here are highly popular for their beautiful views of the coast, sandstone canyons, and iconic Torrey pine trees. The reserve, located about 20 miles north of the convention center within the city limits, consists of 2000 acres of land set aside by the city to preserve open, natural space amidst urban development. Be ready for a steep climb on dirt trails and amazing ocean views from coastal bluffs. Printable trail maps with park information are available; entrance is free, but there is a fee for parking, which varies from $10-$15 per general vehicle depending on demand. 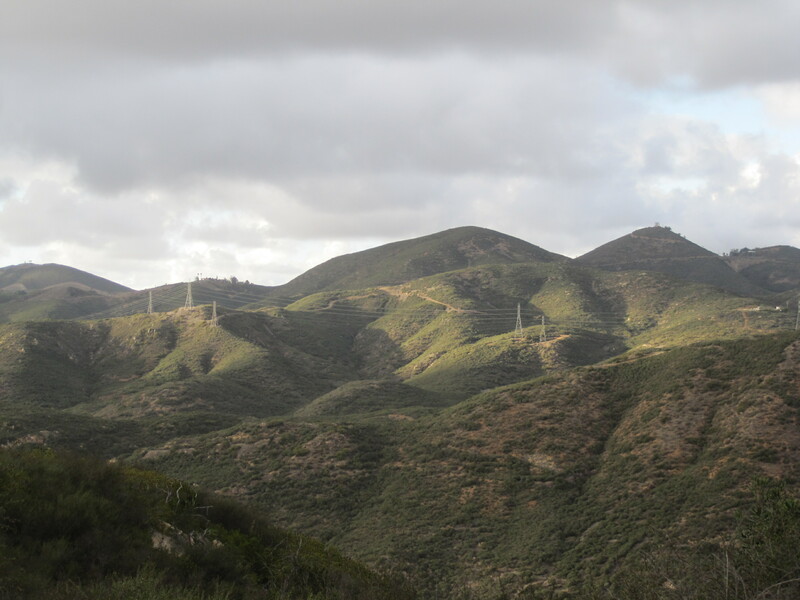 Mission Trails Regional Park – This 5,800 acre park features over 40 miles of trails through rocky hills, valleys, and open expanses. At around fourteen miles northeast of the convention center, it is one of the closest natural areas from the city and a great destination for a rejuvenating last minute hike. An interactive map is available to help you choose your route from the network of trails. Cowles Mountain, the highest peak within the San Diego city limits, is a popular destination in the park with a modestly steep climb up. Mission Trails can get quite crowded, especially on the weekends, but the panoramic view of San Diego County from Cowles Mountain is no less grand. Mount Woodson – Slightly less well-traveled than its nearby neighbor Iron Mountain, Mount Woodson is a 33 mile drive northeast of the convention center between the cities of Poway and Ramona. The length of the hike depends on the route you take, but hikes average 6-8 miles. Though the uphill climb is steep, at least one portion of the trail is paved making for a smooth but strenuous trek. Large boulders along the trail attract climbers, and there are often daring souls lining up to have their turn on “Potato Chip Rock”. On a clear day, hikers who reach the summit can see the Pacific Ocean to the far west and Mexico to the far south. Elfin Forest Recreational Reserve– This easy to moderate hike in Escondido, CA is about 36 miles north of the convention center. Compared to many of the busy local trails, Elfin forest provides a more laid back atmosphere with a bit less foot traffic. The reserve includes around eleven miles of easy to medium difficulty trails leading up to a gradual peak with a great view. Elfin Forest’s name is a reflection of its landscape: a dwarfed plant ecosystem dominated by chaparral. A printable trail map is available. Palomar Mountain State Park – Approximately 70 miles northeast of the convention center, Palomar Mountain State Park is a great change of scene with its sprawling coniferous forests and wonderful views of the surrounding area. Plan to spend most of a day hiking and in transit. Palomar is the second highest mountain in San Diego County at 6,140 feet (Cuyapaipe Mountain in the Lagunas is highest at 6,378) and home to Palomar Observatory, a world-class facility for astronomical research. The observatory, owned and operated by Caltech, is home to the famous Hale Telescope. Hike around on the observatory trail (~4 miles) and take a free tour of the facility (open 9:00am-4:00pm in the summer) while you’re there if you have the time. Trails through the 1,862 acre park are moderately difficult, but the shade of towering trees and cool temperatures due to high elevation are a welcome relief in summer months. Hikes should keep their eyes pealed for deer, wild turkey, bobcat, cougar, and mountain lion sitings. The thick vegetation helps raise your chances for animal sitings; hikers should keep their eyes peeled for rattlesnakes, deer, wild turkeys, bobcats, and cougars! Access to the park is free, but be prepared to pay $8.00 per vehicle to park in a designated lot. Other hiking options abound, including trails throughout Los Penasquitos Canyon Preserve, the Cleveland National Forest, El Cajon Mountain, William Heise County Park, Anza-Borrego Desert State Park… the list goes on and on. To further explore local options, check out the crowdsourced sites: San Diego Hikers and Every Trail. If you prefer to invest in a detailed authoritative guide, check out the hiking guides by author and avid SoCal hiker Jerry Schad. A final word to the wise: When hiking in San Diego county, it is important to remember that summer temperatures are typically cooler in the city and along the coast than they are inland. Many areas of north and east San Diego County regularly reach 90 degree temperatures at the time of the SAA conference in early August, thus staying hydrated is essential. Always be prepared with more water than you think you’ll need. Staying vigilant about the local wildlife–including rattlesnakes that enjoy sunning on dusty hiking paths–is also important. Stay safe and have fun exploring the rich natural resources San Diego has to offer! This entry was posted in Attractions and tagged exercise, hiking, nature, outdoors, trails. Bookmark the permalink.